Researching in the passenger lists of this 1920s period of sea travel throws up many other famous names of the times. The 25 year old Harry G. Selfridge Jr, son of the founder of the London department store Selfridges, is one. We can also find the war poet Siegfried L. Sassoon and from the top ranks of the British Army there is Field Marshal Haig and Lt General Robert Baden-Powell, founder of the Boy Scouts. Turning to the world of politics we come across David Lloyd George, the Liberal politician who became the wartime Prime Minister. Here he is travelling with his wife, Dame Margaret and their daughter Megan who would herself go on to become the first female M.P. for a Welsh constituency. By using TheGenealogist’s unique SmartSearch feature we can identify the family members travelling together on a voyage by clicking on the family icon. On a voyage to Gibraltar in April 1927 we can find the 63 year old widow, Mrs Emmeline Pankhurst, the one time leader of the Suffragette movement. Without Mrs Pankhurst and her fellow suffragettes campaigning for the right for women to have the vote, then Megan Lloyd George would not have even been able to cast her ballot, let alone have had the right to stand for election to the House of Commons. There are numerous authors to be found in these records. In February 1926 Hilaire Belloc, who was one of the most prolific writers in England during the early twentieth century, made the short hop across the channel from Southampton to Cherbourg. The 55 year old was onboard the Orduna, a vessel of The Royal Mail Steam Packet company on its way to New York. Belloc gave his address as The Reform Club SW1, but for others the passenger lists can reveal the details of an ancestor’s home address before they travelled - information which can be very useful when there is no census to consult for the time period in question. For example, the entry for the 21 year old Noel Coward, travelling on the Southampton to New York run of Cunard’s Aquitania that left on the 4th June 1921 - Coward gave his address as 111 Ebury Street London. This was the premises that his parents ran as a lodging house and it was where he kept a room while he travelled abroad. It was also the address where he wrote The Vortex, his first notable successful play. His occupation on the passenger list for June 1921 was that of an Actor. In later transatlantic crossings, however, he is sometimes recorded as a Dramatist, an Author and as a Playwright. 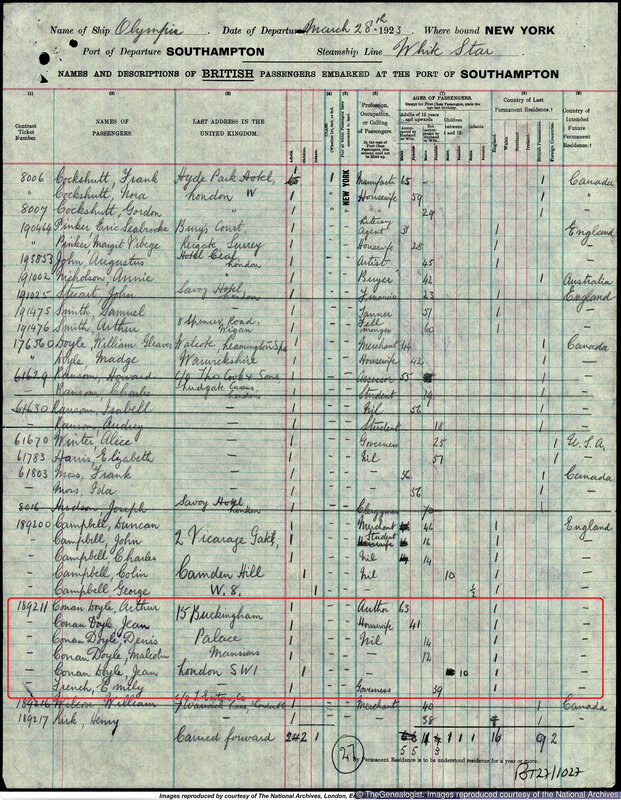 Passenger lists are certainly fascinating documents that can reveal our ancestors overseas voyages and so help add detail to the stories of their lives. They can also be used to clarify where people have gone when we can’t find them in the records at home, as it is all levels of society that can be found in these records. This particular decade seems also to be very rich in the names of the famous as they departed from U.K. ports on their overseas travels. See these and many more fascinating family history records at TheGenealogist.